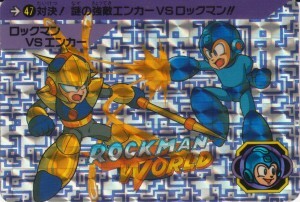 Here’s the last holo-card I have yet to upload from the second set of Carddas’ Rockman trading card series. Rock faces off with Enker, the Rockman Killer (or was that Mega Man Hunter?) Have I mentioned yet that there’s an official game you can play with these? It isn’t very complex like we tend to think of trading card games today, it’s more something that little kids can pick up and play pretty easily. Basically, you and your opponent play a round of Rock Paper Scissors. After someone wins, you each play a card from your deck. 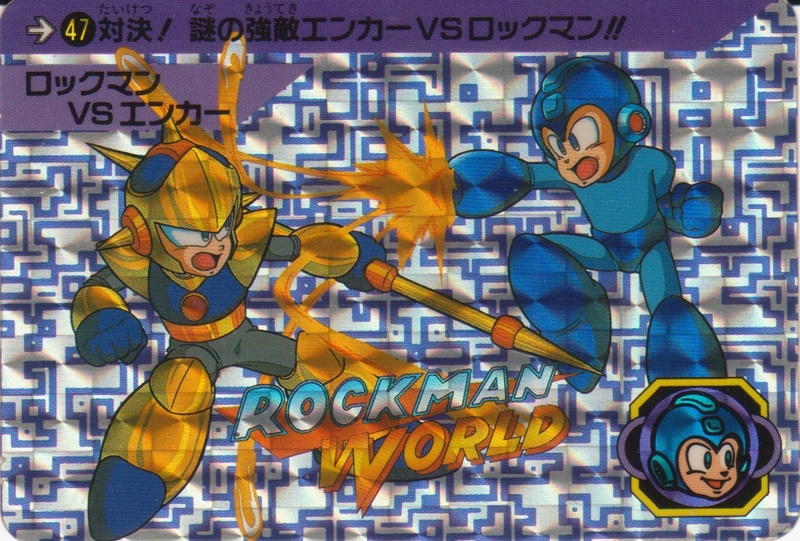 Do you see that Rockman head in one corner of the card? That’s called the Holomark. Rock will be facing either left, right, or straight ahead. If both faces are going in the same direction, the winner of the Rock-Paper-Scissors match wins the hand. If the two holomarks are different, that counts as a draw. Players repeat from step 1. That’s all there is to it! Not too difficult, and rather fun (for a few minutes, at least). 47. Showdown! The Mysterious Arch-rival Enker VS Rockman!! 3 Comments to "Duel Robot Masters"
“Arch-rival”? Shame that Bass ended up taking that role, eh, Enker? For MM10’s promotion, Capcom Unity used the term “Mega Man Killer”. Though, they also used “RKN”. @RAD: Reminds me of Bart Simpson. “I’m only ten and I already got two mortal enemies!” Except Mega Man probably has more than he can count. Good thing most of them are reprogrammable.